Ernie's memory lives on through the memorial scholarship and local memorials and buildings named in his honor. The Ernie Davis Memorial Scholarship Committee is seeking support to continue the annual Ernie Davis and Marty Harrigan Scholarships. Funds are also needed to support the new home of the Ernie Davis statue at Ernie Davis Academy on Hoffman Street in Elmira, New York. The statue was originally dedicated in 1988 at the Ernie Davis Middle School on Lake Street in Elmira, New York. Donations for the scholarships can be made through the Community Foundation of Elmira-Corning and the Finger Lakes, Inc. via Pay Pal. Donate Now. Donations to support the statue's new home can be made through the Community Foundation of Elmira-Corning and the Finger Lakes, Inc. via Pay Pal. Donate Now. 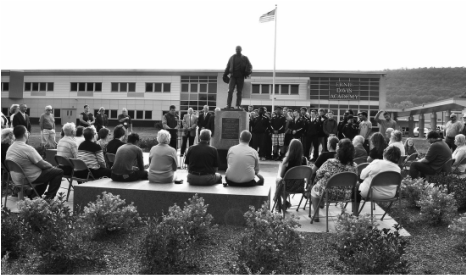 Ernie Davis Academy held a ceremony to honor the moving of the statue of Ernie Davis to the school on Friday, September 23, 2016. Read the full Star Gazette article by clicking the photo.